A summer hike of Mt. Carrigain via the Signal Ridge Trail had me smitten. Some hikes can do that to you. So it was only natural that I wanted to take this mountain crush to the next level by hiking this beauty in the throes of winter. I marked my calendar and made plans to sneak away. Nevermind the fact that two whopping snowstorms hit the area mere days before. I was bandana-over-hiking-boots in love with Mt. Carrigain, a bond unbreakable by two to three feet of fresh powder. Or so I thought. 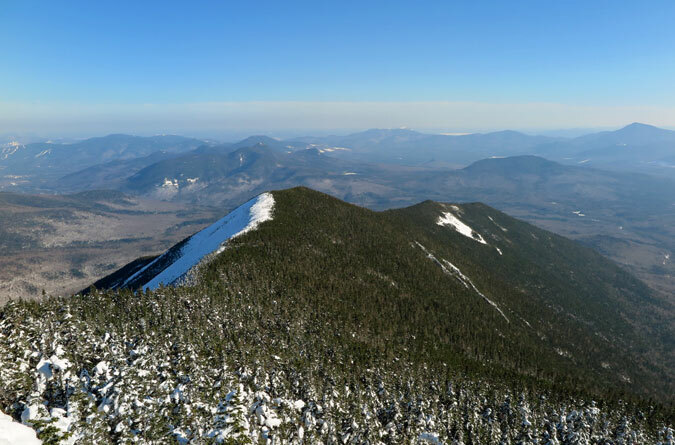 Before I continue with this tale of wanderlust, here’s the winter hiking info for Mt. 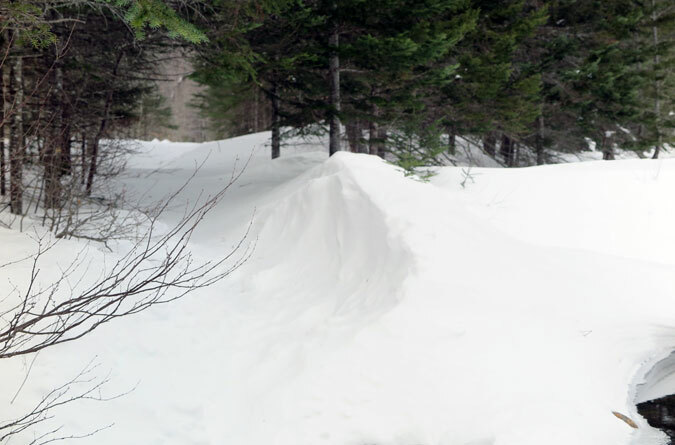 Carrigain that you’re likely looking for: no, the Sawyer River Road to the trailhead isn’t open to vehicle travel in the winter. 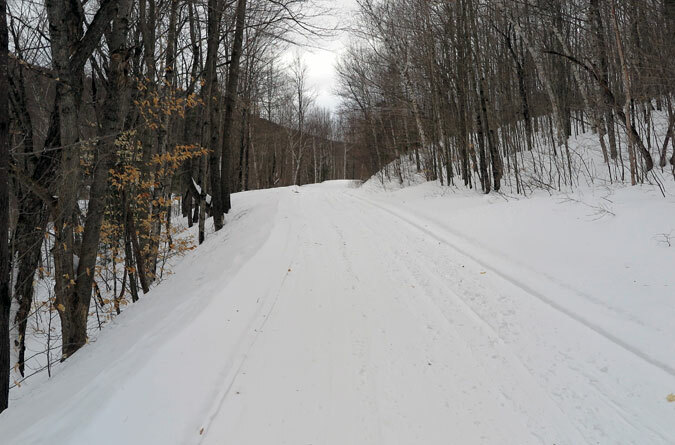 However, the road is a major snowmobile highway, so it’s well packed, and there’s a parking lot big enough to accommodate hikers and snowmobilers where the Sawyer River Road meets Route 302. 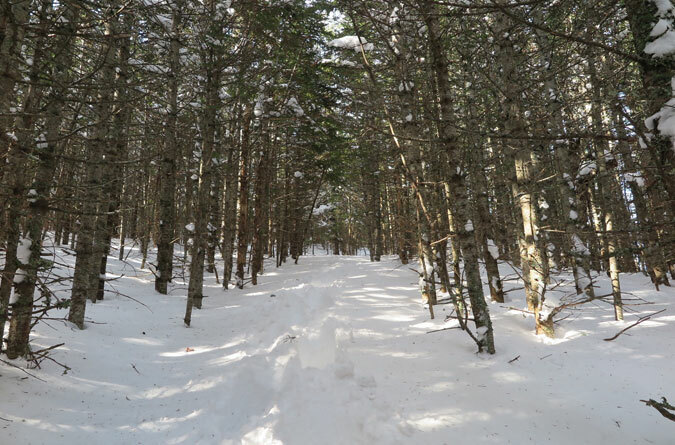 There are two miles of travel on the Sawyer River Road between Route 302 and the Signal Ridge Trail; cross-country skiing this section would be a great option, especially on the return trip when it’s mostly downhill. 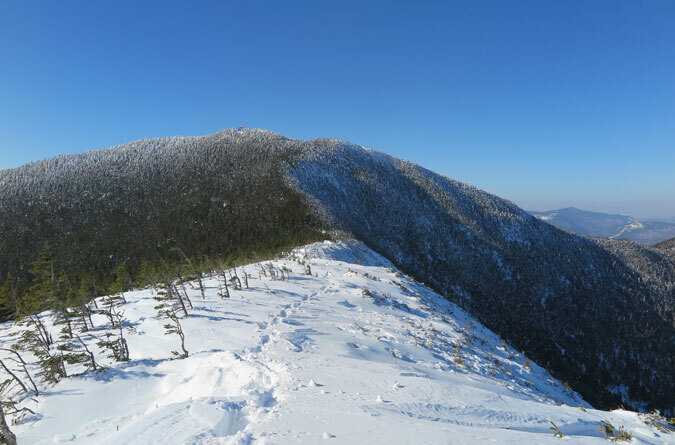 The Sawyer River Road isn’t plowed in the winter, adding an extra two miles of hiking (one way) to reach the Signal Ridge Trail head. Of course, you could always try yanking up the hiking pants to show a little thigh and sticking out the thumb to hitch a snowmobile ride. Just, you know, careful what you ask for…. Now, back to the tale of my Carrigain trail affair. 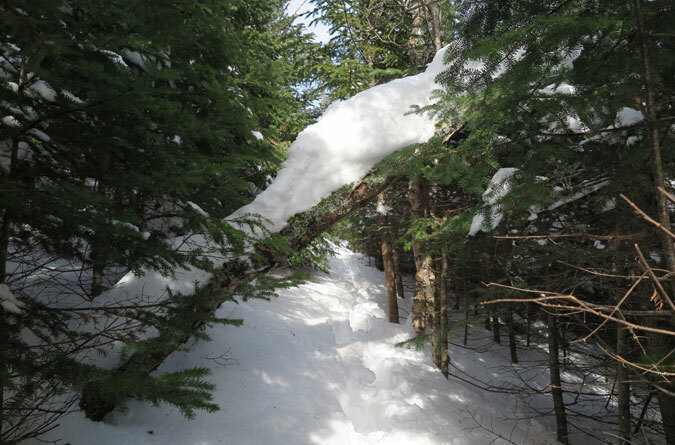 Upon entering the softwoods, the summer memories came flooding back, but it didn’t take long before breaking trail in the deep snow began to take its toll. It turns out that in the winter, Mt. Carrigain can be a real @!#$%. 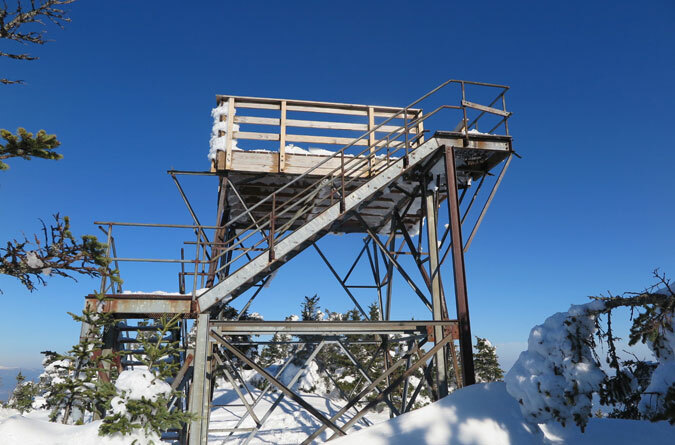 Oh, sure, Signal Ridge and the views from the summit tower are even more mesmerizing with a coat of snow, but they won’t come easy. Then again, that’s half the fun. Or not. What can I say? It’s complicated. 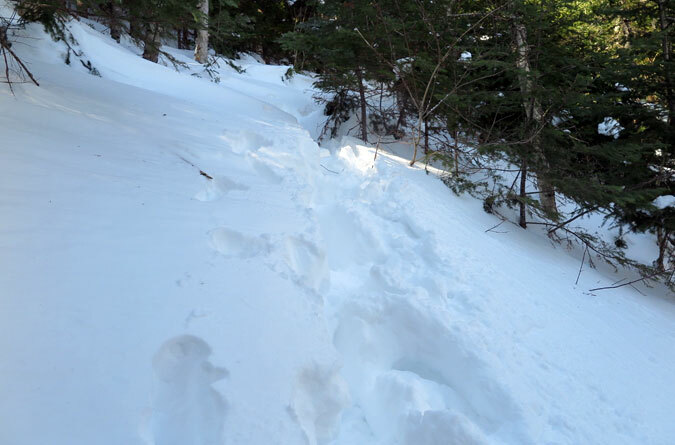 The early going on the Signal Ridge Trail provided plenty of fresh snow with added drifts. Truthfully, I only broke trail for the first mile and a half before being caught by another hiker. On a bluebird Saturday with afternoon temperatures above freezing, we were both surprised that nobody else was on the trail. 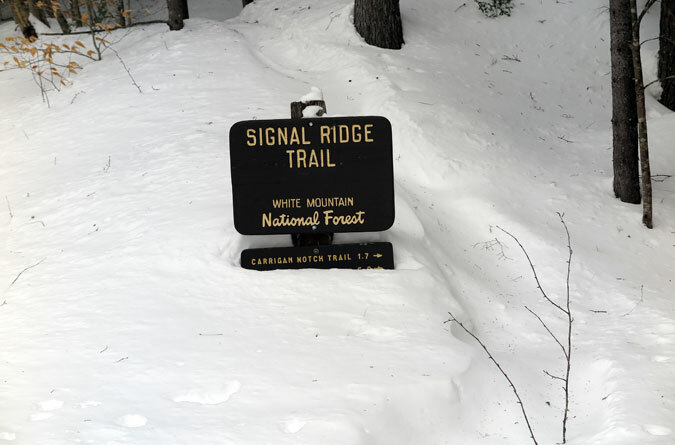 Perhaps others had stayed away due to the snowstorms, but my overall impression is that Carrigain—by being a little bit further out of the way, plus the added hiking on the Sawyer River Road—is a White Mountains 4K-trail less traveled by in the winter. In short, plan for a full day and then some. It was close to 8 AM when I hit the trail, and it was dark out when I stumbled back to my car. The hike itself isn’t oppressively steep (it’s nothing like climbing East Osceola), but where Carrigain gets you is in the relentlessness. The first 1.7 miles to the Carrigain Notch Trail split is mostly flat with water crossings over Whiteface Brook and Carrigain Brook that aren’t problematic. From there, the remaining 3.3 miles to the summit is steady climbing. Even once another hiker took over the trail breaking duties, it wasn’t exactly easy going. Let me present Exhibit A of Mt. Carrigain supplying a heavy dose of tough love. I’m not too proud to admit the fact that Mt. Carrigain used and abused me on this hike. 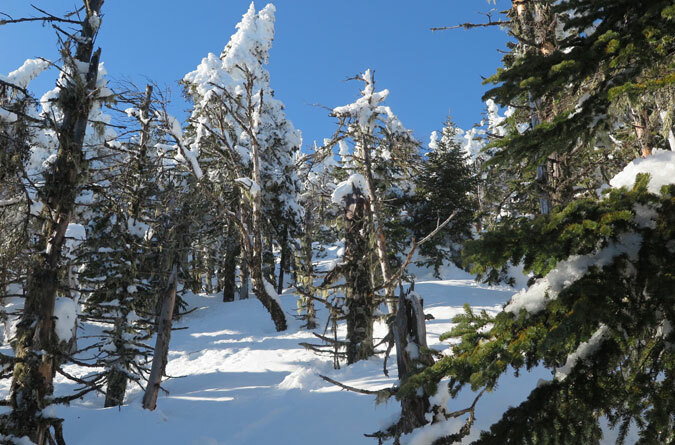 Lifting my snowshoes in a windmill motion to get out of the deep powder led to groin cramping before I even reached Signal Ridge. I had a good mind to turn around, and if it weren’t for the other hiker helping to break trail, I probably would have. But something about the attraction to Mt. Carrigain kept me going. 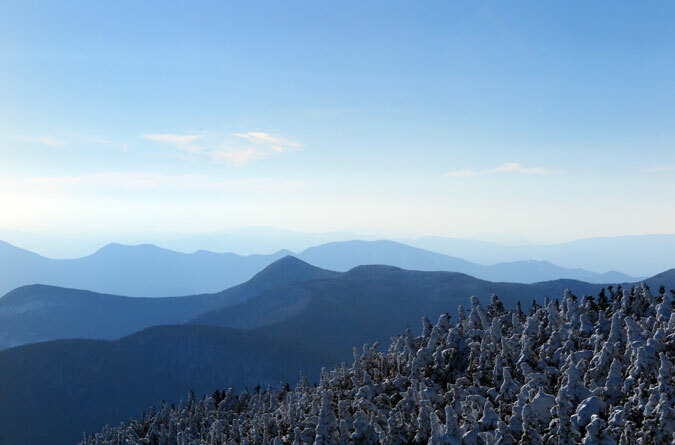 Signal Ridge was a sight for sore, well, everything. The Signal Ridge view of the Mt. Lowell cliffs in the foreground and Mt. Washington in the background. Staying hydrated on this hike was also an issue. I’d brought three Nalgene bottles and found myself rationing the last bottle on the final summit push (not good when your legs are already cramping). On the way down, I filled up at a stream sans filter. If you’re planning on hiking Mt. Carrigain in the winter, packing ample water is something to factor. The final push to Mt. Carrigain’s summit. At last, the Mt. Carrigain summit tower! If you’re nervous with heights, this is a bearable one. 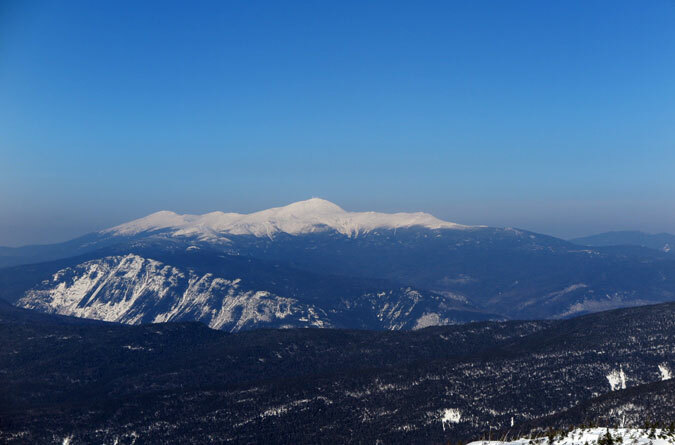 The view of Mt. Washington from Mt. Carrigain’s summit tower was tough to beat on this day. 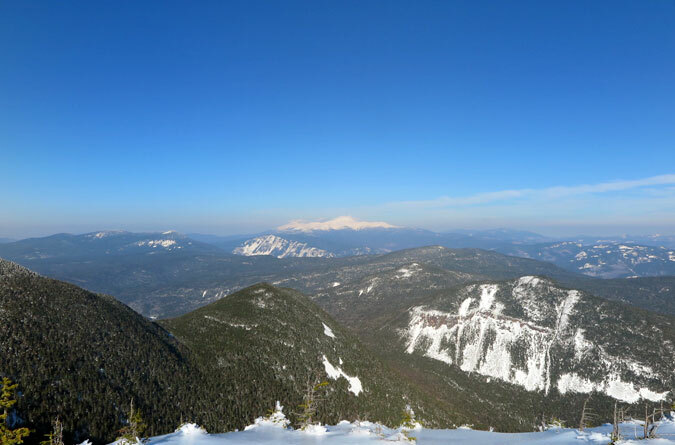 And just like that, I was in a White Mountains state of mind. Looking back down onto Signal Ridge before the return trip. It’s cool, Mt. Carrigain, I ain’t mad at ya. Not with views like this.